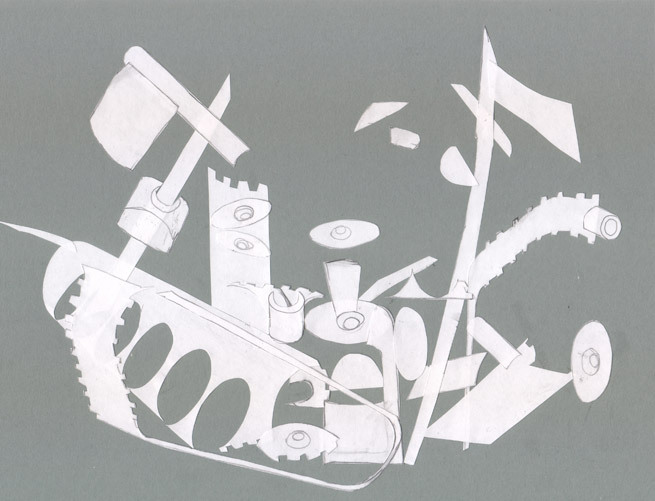 It’s my original tank sketch, cut up into its individual components and arranged in a new formation. I glued about half the pieces down where they landed when I shook them out of their envelope (so. very. tired.). It looked vaguely like a pirate ship, so I steered the rest of the collage in that general direction. It’s very mechanical looking and a little creepy, like it could live on the Island of Misfit Toys. So today’s instruction is: Cut up an old drawing and create a collage by rearranging the pieces. Your own past work is your inspiration today, and this project requires no tutorials.